The Widget enables you to embed Encentivizer features in your website to boost sales and generate leads. 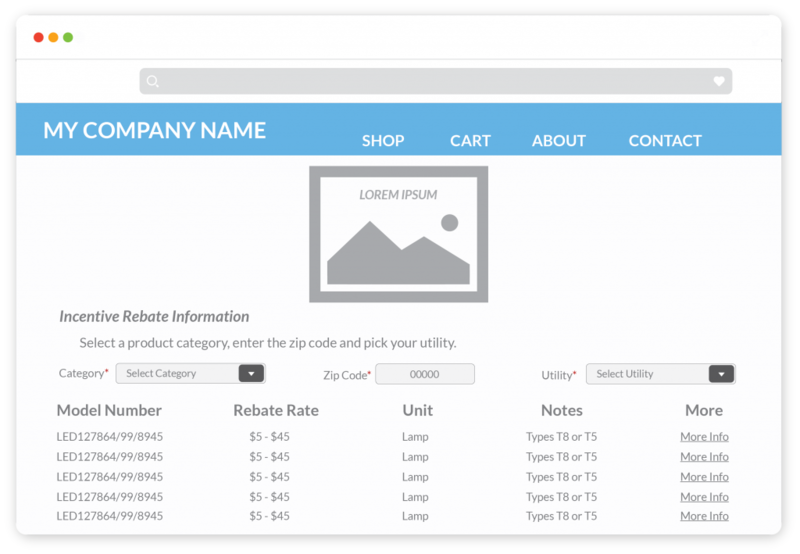 Your visitors can get specific energy efficiency rebate information for your products without leaving your site. Dynamically display information about commercial rebate programs in several formats, through interactive user prompts about their location and contact information. The Widget covers all commercial rebate programs in the United States and Canada, it’s updated daily. Users just need to enter their zip code, select a bulb, tube or fixture type and select their utility. They will get detailed rebate information about each EnergyStar® or DesignLights Consortium® fixture in your product catalog. Sell more products, faster. Quickly and easily connect your customers to rebate intelligence for your specific product lines, which gives them one more reason to complete a purchase now. Never miss an opportunity – generate leads by gating some or all rebate information and require visitors fill out a form prior to seeing it. Transform the way you display products online. Connect your site visitors to energy efficiency rebate intelligence only from Encentivizer. Use this powerful tool to create an unparalleled shopping experience and turn visitors into customers. Show accurate real-time rebate amounts based on your specific product page. Start using rebates to influence purchase decision – include them in your product information now. Want more info? Drop us a line. Old-fashioned phone calls work too – 855.896.0568, option 2. Get this additional functionality for my site now!